The Balochi people are an Iranian people who mainly speak the Balochi language, which reveals borrowings from Persian, Arabic, Sindhi, and other languages. They are politically quite active, especially in dealing with issues concerning Baloch population in Iran and Pakistan, pushing toward an independent Balochistan. They maintain their unique people group identity by singing lullabies to children and praising warriors also have a significant role in Balochi music traditions. In addition, their adherence to Islam reinforces their identity. They are often dispersed into smaller population pockets in the United States. However, they often form their own cultural associations and tend to keep the community active through social occasions. 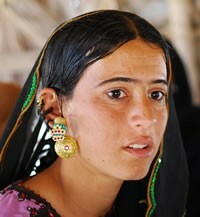 Pray evangelical Christians will intentional examine and discover the Balochi within their metro area. Pray that God will prepare the hearts and minds of Balochi to hear and understand the message of Jesus Christ.